Visakh Homes Limited is a part of the Sree Kailas Group founded in 1983. The Group has an annual turnover of Rs.600 crore and employs over 2000 skilled and unskilled staff. The promoters Visakh Homes Limited have a rich experience in the field of infrastructure developement of industrial complexes and residential apartments for more than a decade. It has already completed 5 multi storied residential buildings, 1 luxury resort and more than 10 commercial complexes/ factory buildings. • Go the extra mile in ensuring customer satisfaction in our projects. ​ Come to Visakh Homes Limited today to find your perfect house. 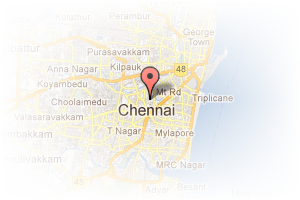 Address: mahalingapuram, Mahalingapuram, Chennai, Tamil Nadu, India. This Broker Profile page for "Visakh Homes Limited" has been created by PropertyWala.com. 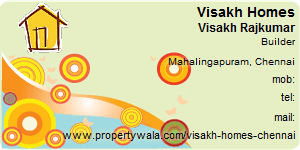 "Visakh Homes Limited" is not endorsed by or affiliated with PropertyWala.com. For questions regarding Broker Profiles on PropertyWala.com please contact us.